A display of John Deere tractors and other farm equipment Moline, Illinois. A blacksmith named John Deere moved his plow factory to Moline in 1848, and the company maintains a strong presence in the area. Founded in 1848, Moline, Illinois, (population 43,768) developed along the banks of the Mississippi River, where waterpower was readily available for operating the area’s numerous mills. The city’s name derived from the French word moulin, meaning mill. Westward bound settlers, many of Swedish and Belgian descent, found jobs in the city’s factories and mills. A blacksmith named John Deere moved his plow factory to Moline in 1848, and his company prospered, drawing several other farm implement manufacturers into the area. Deere & Company maintains a strong presence in the area, and Moline is the location of its worldwide company headquarters. Commercial and residential development has expanded the original town boundaries to the east and southward to the Rock River. 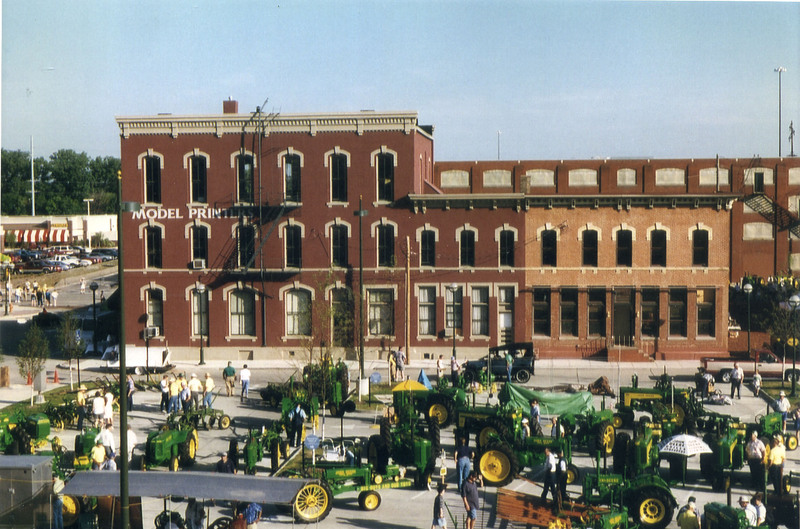 A number of farm implement companies closed in the 1980s, resulting in the demolition of many old factories that had lined the riverfront. This has opened up the area for new commercial and recreational use. The Moline Downtown Commercial District was listed on the National Register of Historic Places in 2007; since then two historically significant buildings (circa 1895 and 1912) have been rehabilitated and restored to their original commercial and residential use. The Rock Island County Historical Society is housed in an 1870s building that was once the home of Deere & Company president Burton Peek. The John Deere Pavilion at John Deere Commons contains exhibits celebrating the history of the agricultural implements industry in the Midwest, featuring a variety of plows, tractors, combines, and other machinery. Each year, 4th, 5th, and 6th graders interested in learning about their community’s past participate in the Lucille Sampson Junior Historian Jamboree. Activities are held in the Rock Island County Historical Society Library, the Butterworth Center, and the Deere-Wiman House. Deere-Wiman House, built in 1872, was home to John Deere’s son, Charles Deere, and his descendents. Butterworth Center, built in 1892, was home to John Deere’s granddaughter, Katherine Butterworth. Both Butterworth Center and the Deere-Wiman House are open to the community as cultural arts centers that develop and support educational programs and events.